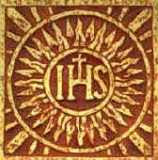 Your post on the most Holy Name of Jesus is far more comprehensive than mine, and I enjoyed it. I like that you always list links for "more information on...."
I have posted three times on the subject in my blog "Grandma's Musings" My most recent post is titled "The Golden arrow". It's rather comprehensive. I'd like it if you would check it out. Thanks for the link to the Golden arrow. I began my blog with posts about family, but I now enjoy researching feast days of Saints and so forth.